Charms and other Anxious Objects, my recent exhibit at The Freud Museum, was the result of an invitation to contribute to the Anxiety Arts Festival London 2014. Curated by the Mental Health Foundation and taking place throughout June 2014, the initiative is directed by Errol Francis and Bárbara Rodríguez Muñoz (Visual Arts Curator). The concept behind the festival was broad and ambitious: to explore anxiety, its causes, its effects on our lives and how it can act as a creative force. I immediately saw the possibilities in this open brief. Anxiety is part of the human condition, without which it is impossible to imagine our functioning. The proposal offered the opportunity to consider the spectrum of anxiety, from what could be described as normal or acceptable to a point where it becomes destabilizing. Work began with research in the archives and museum at the Bethlem Royal Hospital where I was able to search their databases and see objects and papers in their physical forms. I have been drawn to archives as starting points for previous bodies of work, such as Freud’s Coat which was the result of many hours researching in the Freud Museum in 1996; I called while you were out in 2008 was a year-long project exploring notions of absence and presence in the house at Kettle’s Yard, Cambridge;* and most recently Re-Imaging Scott: Objects and Journeys in 2013 at the Scott Polar Research Institute, Cambridge traced Scott’s journey to the South Pole. In all of these projects the archive has offered a context where materials ignite the imagination. In the Bethlem archives I often found myself drawn to simple objects, such as a de-lousing comb or a drinking vessel. In particular, I returned to sets of photographs showing patients entering the hospital as well as images of them after treatment. What I saw in these photographs was an investment of dignity (whether authentic or a construct of the photographer): the patient, no longer disheveled, but presented to the camera in a re-ordered state. In response to this aspect of personal dignity, I created Ghosts and Empties which presented plain objects that we use on a daily basis in order to put forward an image of ourselves to the world. 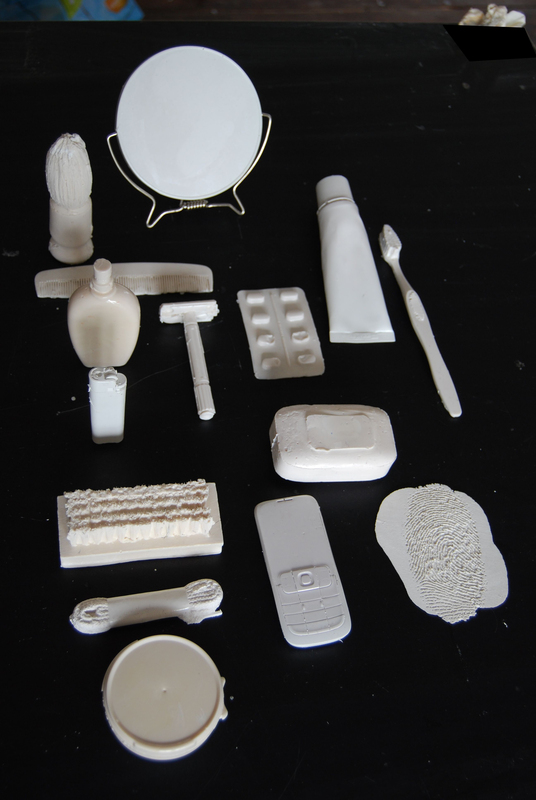 These included a razor, comb and shaving mirror, each cast in white resin. The resin has taken the form of the absent object which was once in the mould. The title comes from a line in Graceland, the song by Paul Simon, which attempts to speak about the relationship we have with objects and how they might come to outlive us. These things hold little value in themselves, and yet have shared our lives and bodies in a most intimate way. Within the context of the Freud Museum, this piece resonated with the possessions which once belonged to Freud that are now on display: his coat, his pen, his glasses. They are forever separated from their owner, yet are charged with his presence, as well as his absence. 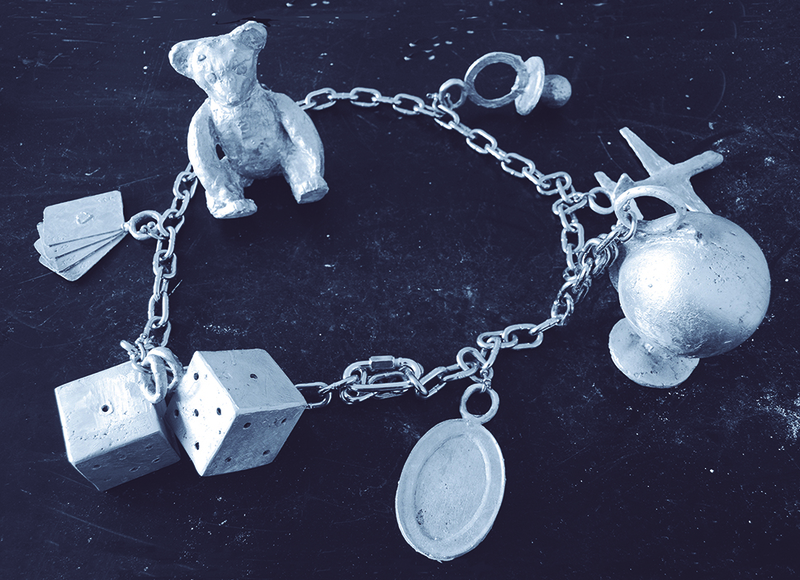 In Charms I & II, I tried to make a connection between the idea of the charm bracelet and the restraints used on some of the patients I had encountered in the archives at Bethlem. Charm bracelets carry wishes and desires as well as embodying magical beliefs or faith in the power of the material world to influence our future destiny. A further source was the simple linear drawings created to represent objects in intelligence and personality tests from the 1940s. These included the Cattell Infant Intelligence Scale, presented in a small suitcase, which contained various items and drawings for children to identify, such as a flower or umbrella, rattle and doll, as well as tests to match round or square pegs in corresponding holes. The Stanford Binet Tests included basic images which infants would be asked to select in answer to such questions as, ‘which one would you drink out of?’ or ‘which one goes on your feet?’ The materials for these tests are characterized by their need to stand in for a word. Their graphic style reinforces this function of signification. I began to put the two ideas together and felt that the form of these rather kitsch pieces of jewelry could be read as materializing the hopes and aspirations of the wearer. But by enlarging them, what had originally been a source of comfort and reassurance contained the potential to become burdensome and disabling. 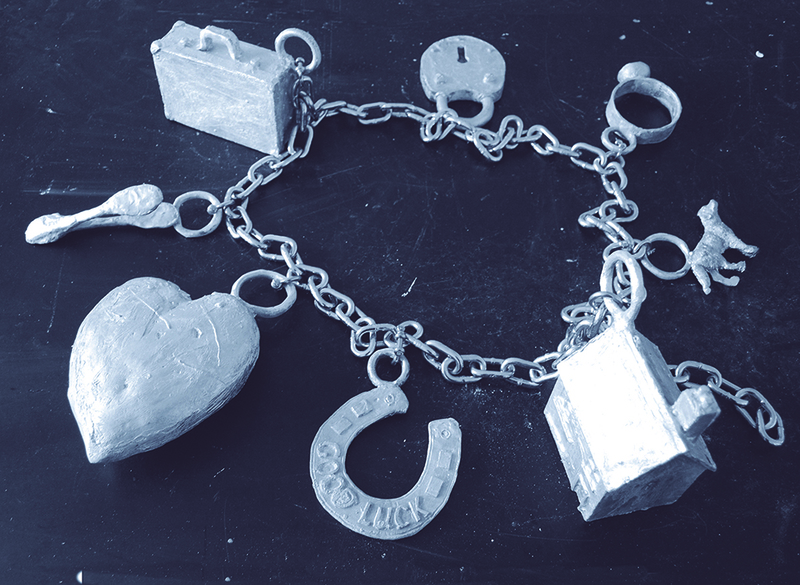 I made two bracelets, each with eight charms, which I cast in aluminum in the foundry at Chelsea College of Arts. The objects – a teddy bear, a pair of dice, a cameo picture frame, a pacifier, a globe, a house, a heart, a ring, a suitcase – were intended to represent wishes; a heart could suggest a longing for love; a house, for personal sanctuary. Enlarged, cast and connected by a thick steel chain, these meanings change from what was once an intimate decoration to an exposure of the soul. The bracelet has become a restraint. While the metal suggested coldness, opacity and weight, I made another version, this time in clear glass. Here, the material pointed to fragility, transparency and unsubstantiality. While working on this project, I would often have the radio playing and I began to notice how many songs seem to speak of anxieties, how popular music provides a soundtrack to a life led in this highly strung state and what it might say about our historical moment. I used the charm bracelets as the focus for a set of postcards in which each object was juxtaposed with the title of a popular song. In Soundtrack to an anxious life, the image of the heart was set against What becomes of the brokenhearted?, the suitcase juxtaposed with Homeward Bound, and so on. In this way I wanted to connect with popular culture and the manner in which songs are cherished for sentiments we often find difficult to express. This was my soundtrack: 15 titles each suggesting hope, fear or aspiration. They were printed as postcards as if to send coded messages in the spirit of the traditional ‘wish you were here’. Exhibited at the Freud Museum, I wanted each postcard in its own acrylic case to function as a small accent, as a little cry for attention. In attempting to describe my creative process, there is a danger in it appearing too rational, too planned. Language imposes structure and order, but the reality is of fleeting thoughts, sketchbook notes and captured fragments which slowly coalesce into ideas that are then further transformed through making. Paul Coldwell is Professor of Fine Art at the University of the Arts London. He has exhibited widely in public collections, including Tate, V&A, British Museum, the Arts Council of England and Musée d’art et d’histoire, Geneva. His recent exhibitions include A Layered Practice Graphic Work 1993-2012: a retrospective, staged by University of Kent, and Re-Imagining Scott: Objects & Journeys at the Scott Polar Research Institute, Cambridge 2013. He writes regularly for Art in Print, Print Quarterly & Printmaking Today, and his book Printmaking: A Contemporary Perspective was published by Black Dog Publishing in 2010.